JDK 1.6 compatible with JDK 1.5? You basically need to set the -target attribute. Also see javac /?. Also see this example in javac's documentation. Update: as per the comments you're using Eclipse, you can just change the compiler compliance level on a per-project basis. Rightclick project > Properties > Java Compiler > Compiler compliance level > 1.5. See screenshot. You can download JDK 1.5 from the Sun Archive. You should be able to set the compliance level on your compiler / IDE to 1.5 so that any incompatibilities are flagged (via compiler warnings). You can then fix whatever needs to be done to make your code 1.5 compatible. 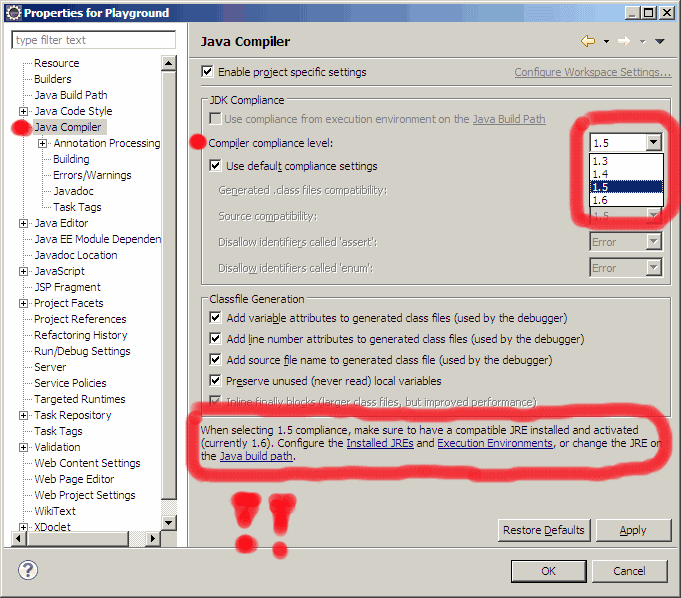 In Eclipse for example, you go to Preferences / Java / Compiler and set the compliance level to 1.5. It's probably something similar in other IDEs.